Today, 40,000 people took to the streets in a demonstration against rent madness and displacement. How have the demands, which were also supported by parts of the Berlin Senate, been put into practice and how have we begun to get our neighbourhood back? Many demonstrators joined this project on the spot in Wrangelstraße. This made it all the more dramatic how the Senate dealt with such practical forms of action. 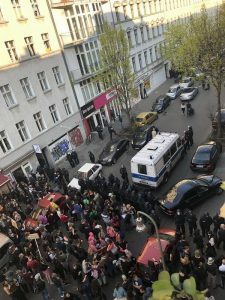 After the police were first prevented from entering by demonstrators present, the police violently cleared blockades in front of the shop and smashed the door of Wrangelstr. 77. The people in the shop, as well as the demonstrators in front, were arrested and many activists and solidary neighbours present were injured by batons and pepper spray. Members of the House of Representatives as well as members of the Bundestag and journalists were also violently prevented from exercising their right of observation by the police. Senator of the Interior Andreas Geisel was informed about the police operation and is politically responsible for it. Besetzen, Berlin, April 6, 2019.